There were originally 10 watches on this list but two of them, Vacheron Constantin’s Traditionnelle Twin Beat Perpetual Calendar and Piaget’s ultra-thin Altiplano with meteorite dial have been covered earlier. Below are eight more watches from SIHH 2019 that also struck the right chord, be it technically, aesthetically or both. 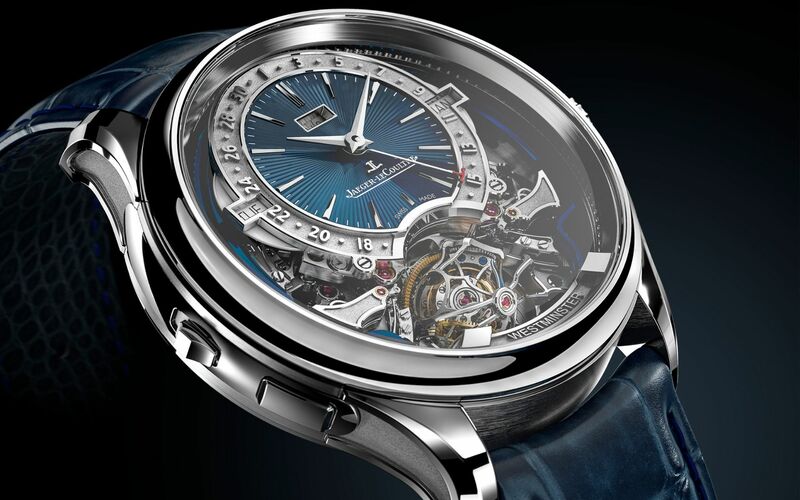 Stunning good looks aside, the fifth Gyrotourbillon from Jaeger-LeCoultre boasts a smaller multi-axis spinner so that the watch can be smaller for a better fit on the wrist. Other technical feats include a constant-force mechanism that consistently feeds the tourbillon with energy and a minute repeater that mimics the chime of London’s Big Ben. There is something practical – and incredibly appealing - about a time instrument that has been stripped down to its bare essentials, leaving only the necessary to work their charm. Inspired by night flight, the skeletonised version of the Santos watch is endowed with bridges coated with SuperLuminova that illuminates in the dark. Also note how the bridges have been designed to form the signature Roman numerals for the hours. The watch boasts a case, a bezel and a protective shield of the crown made from recycled titanium called EcoTitanium. The blue strap is made from recycled PET material. Blue luminescence improves legibility of the dial and the dot on the uni-directional bezel when underwater. But the best part of this boutique-exclusive Panerai diver, which is limited to 19 pieces? It gives the owners the once-in-a-lifetime opportunity to train under Mike Horn for a few days in the Artic. Last year’s Freak Vision was the first commercially produced Freak with an automatic movement. This year, Freak X, also equipped with an automatic movement, becomes the most affordable Freak yet with, for the first time ever, a starting price below RM100,000 for the titanium version. The highlight from the collection is the one with the Carbonium case, an ultra-light and sustainable material used for airplanes’ fuselage and wings; it’s the first time Carbonium appears on a watch. This year’s Heritage collection adopts various vintage design cues, specifically from the 1940s and 1950s. This watch, in particular, stands out for its eye-catching salmon pink dial. Domed for greater depth, the Heritage Pulsograph’s dial also features at least three different finishes. Notable too is the chronograph minute counter with its ‘3’, ‘6’ and ‘9’ indications inspired by the old-school international payphone look. Girard-Perregaux debuted the carbon glass, a new hybrid material consisting of carbon fused with fibreglass. Achieved through a patented process of extreme compression at high-temperature injection, carbon glass is stiffer than steel by 100% and a density close to 1, which makes it float on water. Its other advantage is its absolute impermeability, a feat that has never been matched by other carbon-making technique. And we love how it has given this Laureato a unique space-meets-blue appearance. Sapphire on sapphire has never looked more breathtaking. H. Moser & Cie. has crafted a transparent sapphire case around a dial set with a total of 264 baguette-cut sapphires in shades of blue that gradually get lighter closer to the centre. We don’t think Richard Mille has ever been this surprising, colourful and fun. Taken from the Bonbon collection (even the name is a hoot!) inspired by sweet treats and fruits, there are 10 different confections in 60 different colours to choose from but we are partial to these pink, yellow and green marshmallows, enameled just so to evoke their velvety fluffiness. The white ceramic case only enhances their sweet appeal. Watches & Jewellery SIHH 2019 Jaeger-LeCoultre Montblanc Cartier Ulysse Nardin Panerai Richard Mille Girard-Perregaux H.Moser & Cie.